Williamsburg, NY - Some officials who fancy themselves champions of Kent Avenue’s two bike lanes — have joined a coalition of Hasidic residents and local businessowners in now demanding that one of the lanes be removed to restore parking on the east side of the busy avenue. A who’s who of electeds and neighborhood leaders — including Borough President Markowitz, Councilmembers David Yassky (D–Williamsburg) and Diana Reyna (D–Williamsburg) — made their demand known in a letter to the Department of Transportation. Yassky — a backer of bike-friendly initiatives including a long-planned Greenway that will eventually create two bike lanes on Kent Avenue that are buffered from car traffic by a line of trees — signed on after taking heat from the Williamsburg’s Satmar community at a neighborhood forum. At that meeting, one of the community’s main spokesmen, Isaac Abraham, threatened that Hasidic Jews would block traffic to protest the bike lane. But Yassky’s spokesman said his boss hasn’t changed gears when it comes to cycling. “[Sending such a letter] seems like an anti-bike thing, but that’s not where we’re coming from at all,” said Yassky’s spokesman Jake Maguire. “We want to see a bike lane there and we expect to see a bike lane there, but we want a bike lane that the community supports and one that is implemented in a way that is collaborative,” he added. Community Board 1 member Evan Thies said he signed the letter to encourage the city to get started on the long-promised Greenway — a pair of walking and biking paths stretching from Greenpoint to Sunset Park, said the best way to get the Greenway done is to put “both [existing] bike lanes on the west side of the street now.” “That way we can plant our flag there and build out [the Greenway] accordingly in the next few years,” said Thies. 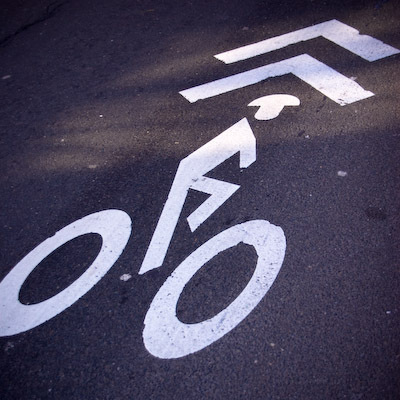 That opinion has some support at the Department of Transportation, whose bike program coordinator Josh Benson said that the agency had no plan to remove the bike lane on the west side of the street. But the pols’ letter may be changing things. This week, the agency’s spokesman Seth Solomonow said DOT was now looking into the matter. The cyclist lanes are not going away but at least inject some common sense into the planning and correc mistakes that have been made. The cyclists are not angels. The fewnon polluting cyclists do not come close to balancing the extra pollution from the extra traffic delays due to diminished traffic lanes and parking. The alleged health benefits are falsoe, some cyclists might be healthier but that gain is very quickly counterbalanced by injuries of cyclists. Even if you banned cars from the street totally some cyclist wouldd fall due to a pothole and, GET READY for lawsuits against NYC. About time a politician undersood they are voted in to "support" a district, not impose bloombergs will on the rest of us. Why are people so anti-satmir on this issue? They have a right to say we DON'T want this in our community. It is a basic constitutional right. Why is the city pushing the cyclist agenda on a cummunity that asks to be left alone? If the city wants to add bike lanes, which will lose parking and hurt business, they need to understand that they are damaging a community and its business. Who gave Emperor Bloomberg that right? The city should but a garbage dump in his fancy WASP neighborhood. Maybe Bloomberg the Emperor can get additional revenue from more tickets if there is less parking? Wow! So I don't know who's credit this is (prob a whole bunch of people), but Willy is FINALLY getting some representation in the way BP and F'Bush always got. Thanks Yasski, and all other officials. It makes no sense to have in Willi on every avenue a bike lane. We now have it on Marcy, Bedford, Wythe, and Kent Avenues. 99.9 of the people living in this area are not driving bikes and they won't in the near future. Now when people talk that we need to understand the people around us. Someone should go out and count how many bikes we have on Wythe Avenue a day. For just a few the City wasted millions of dollars. I think it makes no sense. I am a driver coming to Willi every day, i just keep on wondering who's "brainstorm" engineered this stupid idea, it's a total disaster, causing severe traffic congestion, parking problems, plus putting the cyclists lives as well as the pedestrian's lives in danger. Kent Avenue used to be a good freeway to get around the so congested Avenues, now with these stupid bike lanes its a mass before their were two lanes now their is only one lane and all the trailers and slow moving vehicles are using this avenue so when you have a slow moving trailer you are stuck there, its a disaster! whose idea was it to destroy an entire neighborhood because a few bikes? isn't it enough the bike lanes on Bedford, Wythe, Marcy? its ridiculous how a few guys with their own agenda can destroy an entire neighborhood! Too little too late. The bike lanes were forced upon us without consulting the community, and against the wishes of the community. Bloomberg couldn’t care less if Williamsburg becomes paralyzed and ruined. He wants bike lanes because he relates to the hipsters and not with Williamsburg’s residents. So when its hipsters verses Hasidim, he’ll side with the hipsters regardless of the cost. I will hold to account all politicians pushing these bike lanes, and will campaign aggressively against them. Yeah, I can see these people backing the community, as they chow down on their burgers and fries leading their sedentary lives. Anybody who has to park on Kent understands the problem. The way the traffic flows, you have to park miles away if you can't park on the street. You have the ramps to get onto the BQE, traffic going onto Flushing and down Bedford. A bike lane is a good idea, but the sakana nefashos that it causes when it brings isha zona with no clothes on into our neighborhood is terrible thing. There are a few bikers who go on Kent ave, but they could get to the same place via Bedford and this would be worse. If they just put a lane to go across the Navy Yard, Steiner Studios Etc, it would eliminate 99% of the problems. “ Yeah, I can see these people backing the community, as they chow down on their burgers and fries leading their sedentary lives. You are mixing two issues that are in no way related just to change the subject. The bicycle lanes are a problem. They create more traffic, delays and YES, create more pollution than can ever be saved by an increase in cycling. The bicycle lanes, by requiring a diminution in traffic flow and legal parking or even legal standing areas have made life miserable for many people. As a motorist I have found some cyclists to have attitude issues. Some cyclists are well aware that unlike motor vehicles, they have no plates or even licensing. There is nothing to be lost by being rude, zipping by pedestrians that have the right of way and, worst of all, racing on the side of an unloading yellow schoolbus and hitting kids. Despite the current craze to be green and fuel efficient these represent dangerous, illegal acts that will not be tolerated. "Yeah, I can see these people backing the community, as they chow down on their burgers and fries leading their sedentary lives." ...can u explain this comment?!?!?!?!?!?!?!? and what does child molesting have todo with parking? why are writing comments on vosisneias?, rather put all your eforts and stupid comments and put it towards capturing child molesters in their schools! Aryeh, can you stop with this stupidity of "Isha Zona" ??? THIS IS NOT THE ISSUE!!! And moving the bike lanes to the navy yard will NOT solve 99% of the problem. What about the people living in 450 Kent?? What about all the business being lost because there's no parking? As much as I want to thank all these people that are working hard for us, I still think that they will not succeed, Bloomy is way to powerfull!!! He is a dictator. And the DOT is just following his rules. Excuse me?? Did I hear that right? "No one is against more bike lanes"?? Well I am!! I am fed up to see all these bike lanes pop up all over the place!! Enough with this "Green" garbage! !